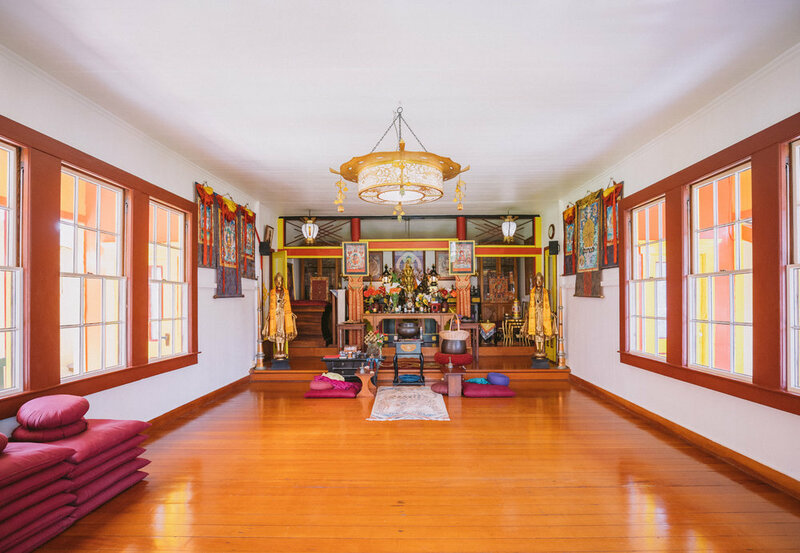 Nechung Dorje Drayang Ling is a non-sectarian Buddhist temple and retreat center in Wood Valley, Ka’u on the island of Hawai’i. It is a center for the dissemination of Buddhist teachings, a place for great masters to teach and for students to receive and actualize these instructions through contemplation and meditation. Equal in importance is to provide facilities for other religious, secular and community groups to hold programs in pursuit of their respective philosophies and practices. Individual visitors may also stay here for quiet introspection and rest. Estabilshed in 1973 by Nechung Rinpoche, the grand lama of Nechung Monastery in Lhasa, Tibet and Dharamsala, India; the temple hosts many programs with head and lineage lamas of all the schools of Tibetan Buddhism. Seminars and retreats cover a wide range of subjects, from foundational philosophy to the Highest Yoga Tantras and Dzogchen. His Holiness the Dalai Lama dedicated Nechung Dorje Drayang Ling in October, 1980; and visited once again in April, 1994, giving a public talk to a crowd of several thousand people. Throughout the years, consistent efforts have been made to renovate these historic structures; and to landscape the grounds into the beautiful park it is today. Towering eucalyptus, palms, and bamboo encircle the brightly painted temple and its enclave of buildings. The vivid colors of tropical flowers punctuate the rich green foliage, and often, the scent of wild jasmine and ginger blossoms permeates the entire space. There is an extraordinary peaceful ambience here – an intangible feeling of serenity and refuge from the ordinary world. The future is a vision in support of His Holiness the Dalai Lama’s message of individuals’ responsibility in the global community through personal clarity, insight and altruistic actions. Nechung Dorje Drayang Ling will continue to develop programs to address the spiritual and environmental concerns of the local and international community; build the necessary facilities to hold such events; and offer a conducive environment to give human beings the inspiration and favorable circumstances for the cultivation of compassion and wisdom, to accomplish the results of happiness and world peace. The above photos were taken by Andrew Richard Hara on New year’s Day 2019. Sublime in all three worlds – above, on, and below. Brings joy and contentment to all. is the Island of immovable meditative stabilization. May the three poisons be transcendentally pacified. 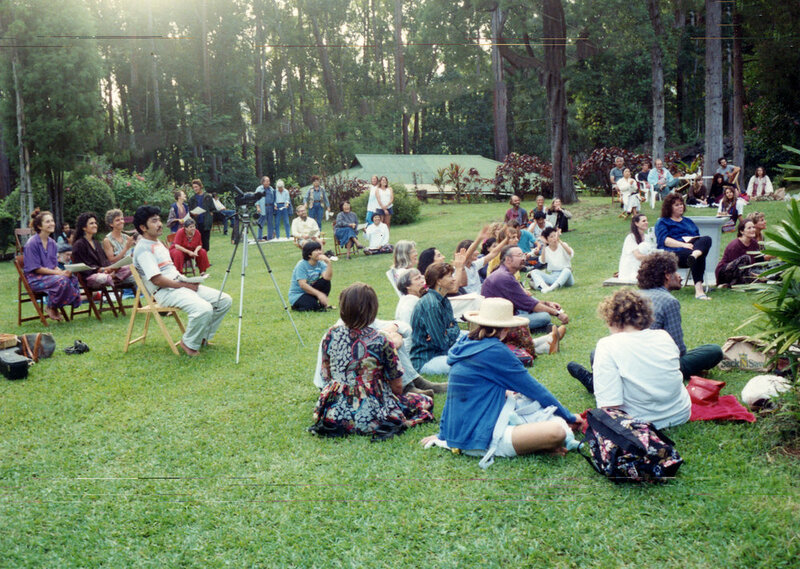 One of the most historic events to take place in the Ka'u District on the Big Island was the visit of His Holiness the Dalai Lama to Nechung Dorje Drayang in Wood Valley in 1994. Over 3500 people came to listen to his afternoon talk as he spoke from the temple veranda. This moment was the culmination of over two decades of work and activities by numerous people at this secluded hidden valley. Jesse Sartain and Nancy Gustafson were amongst some of the eager pilgrims who journeyed to India in the early 1970's. They were touched by the warmth and friendliness of the Tibetans, and the profound teachings of their faith. This inspired them to invite a lama and start a center for Buddhist study and meditation in Hawai'i. 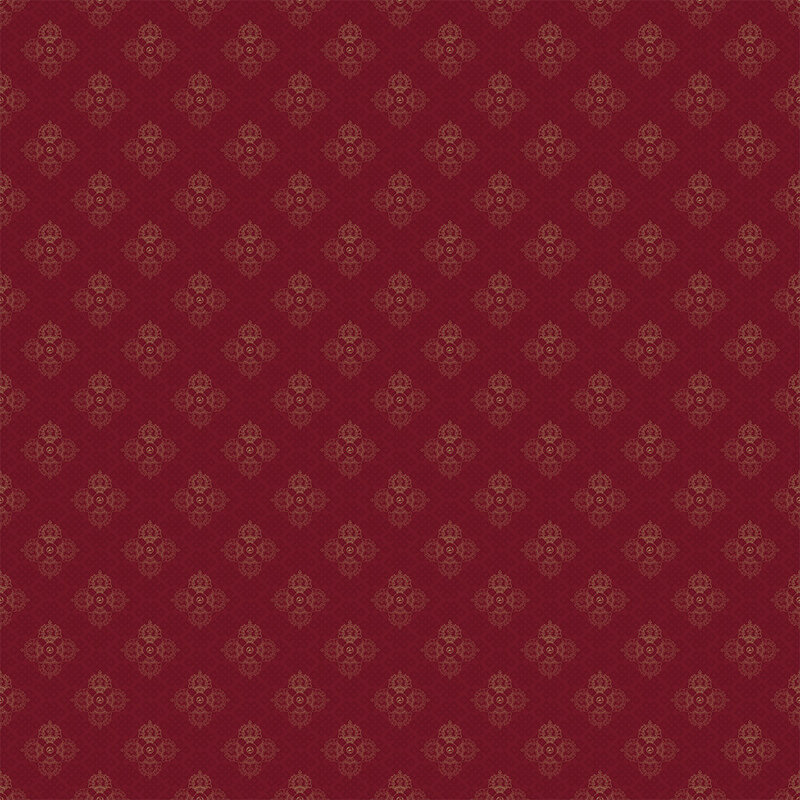 They presented this idea to Nechung Rinpoche, whom they met through a Nechung monk, and Rinpoche agreed to come. A handful of high lamas had relocated to the United States in the 1960's, including Dakchen Rinpoche in Seattle, Washington and Taktse Rinpoche (Thupten Norbu) in Bloomington, Illinois, where they had been offered university positions to teach Buddhism, Tibetan Culture and Language. Tarthang Tulku and Trungpa Rinpoche were amongst the first to establish large centers in California and Colorado. For the Tibetans, Hawai'i's cluster of islands in the middle of the Pacific was as remote as their native homeland encircled by snow mountains. Due to its geographic location and antiquated foreign policies, these mountainous people did not travel beyond the boundaries of the Asian continent prior to 1959. Then living in exile, under a refugee status, travel documents and visas were not readily obtainable. So despite Hawai'i's multi-ethnic culture, rich Asian heritage, and large Buddhist population, it had not become a destination for Tibetans. The first Tibetan lama to come to the Hawaiian Islands was His Holiness Dudjom Rinpoche, the head of the Nyingma lineage. He came to Oahu on Thanksgiving Day, 1972 on his initial visit to the West. A teaching was given at the Honpa Hongwanji Mission on the Pali Highway, under the sponsorship of the Buddhist Studies Center. Following the auspicious visit of Dudjom Rinpoche, they began searching for a suitable location for a temple and meditation center for Nechung Rinpoche. At the University of Hawai'i in Hilo, they met an anthropologist named Professor William Bonk. It so happened that Professor. Bonk had just completed a research paper on abandoned Buddhist temples and Chinese tong societies on the Big Island. He told them of the temple in Wood Valley which had been abandoned when Ka'u Sugar closed down an adjacent camp for cane workers. Since the Nichiren Mission had not been active for some years, a sublease was given to the Vajra Sangha, a non-profit organization set up for the purpose of sponsoring Nechung Rinpoche and channeling the funds for the temple restoration. Restoration on the temple buildings began in November of 1973 and the initial phase was completed a year later. Fundraising efforts to support the project were organized in Honolulu for the cause. These included the Diamond Head Crater Festival and the Manoa Valley Pops Festival, with local musicians and groups. Vajra Sangha later dissolved, and in 1976, Nechung Dorje Drayang Ling, a non-profit 501(c)3 religious organization was formed. This temple was the first Nichiren Mission built in the islands. In 1902 with donations collected from its members and a labor force of the Buddhist community in Ka'u, it was originally located in "Church Camp". At present day, this is about half way from Wood Valley to the town of Pahala. The following story is an interesting account of why the building was moved from its original place, as told to and interpreted by "Ka'u News". "The Nichiren Shu temple was formerly located in 'Church Camp'. One day, probably about 1917, Ka'u was hit by a severe storm, causing much flooding in many areas. Since the temple was located on relatively low ground, it was also soon threatened by the rising waters of a nearby stream. The temple priest, concerned about the safety of his family, sent them to stay with others in an adjacent camp, but decided to remain in and guard the temple with his closest friend. As the day wore on, the flood waters rose higher and higher until nightfall, when the temple was completely cut off from other dry land. It happened that this storm occurred just before New Year's, and the church had purchased a large cask of sake to be served to members during the holidays. Confronted with the prospect of being swept away by the rampaging waters, the pair, after much deliberation, were forced to make a momentous decision. They decided that if they were going to die, they should at least die happy, and so proceeded to drink the sake supply. On the safety of high ground, a friend of the two brave sentinels worried through the night, speculating on the outcome of the temple. The next morning's early light revealed happily that the temple had survived, but, there were no signs of the venturesome pair. Hurriedly, a rescue party was organized, which forded the swollen expanse with the aid of fencing wire. Slipping and scrambling across, the apprehensive rescuers finally burst into the temple, to find the priest and his companion uproariously drunk, having the time of their lives!" (Ka'u News - March 1, 1973). Due to this storm and the extensive damage to the building, it was disassembled and moved to its present location between Kapapala and Wood Valley camps. The temple was rebuilt in 1925, and became the center of a busy village with two schools, several stores, a gas station and a community center. We welcome you to visit us in Wood Valley, on the Island of Hawaii. No reservations needed. A $5 donation is requested from visitors. 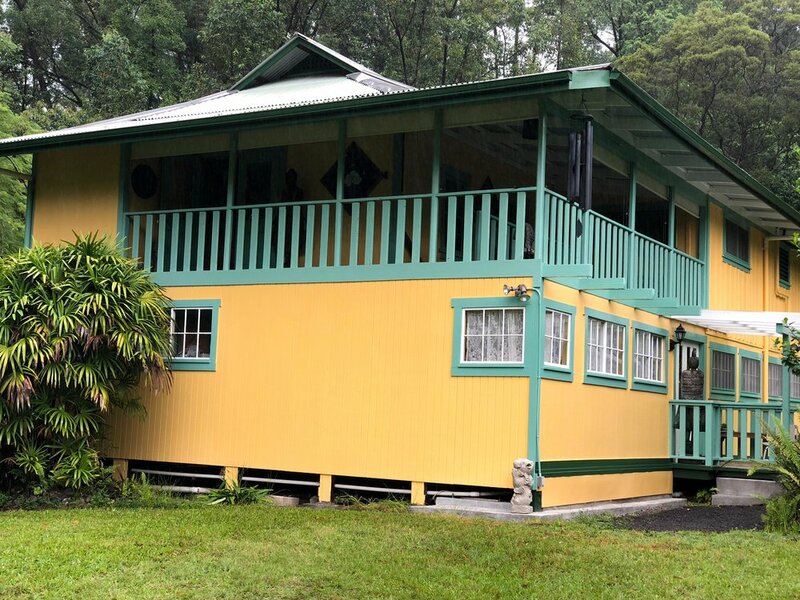 Relax and enjoy the peace and quiet of our grounds by staying overnight at our guest house. Individual or group stays available. Feel free to contact us by phone or email with any questions or to book your visit. 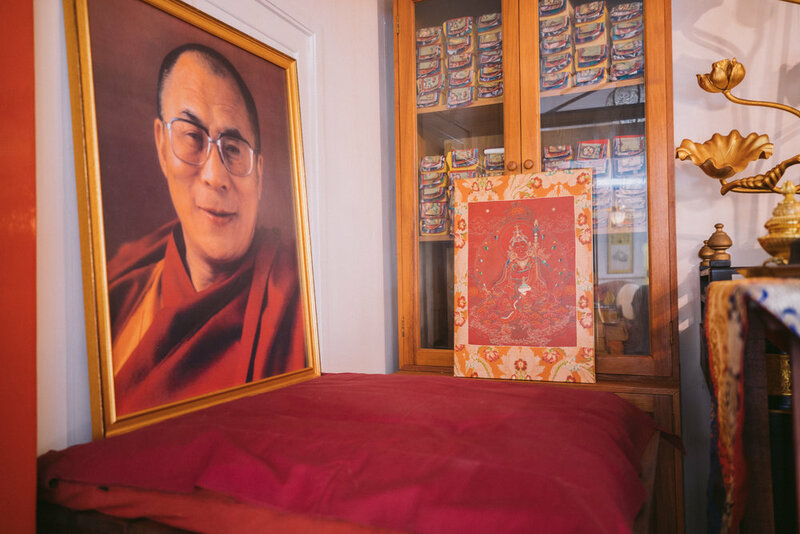 Over the past four decades, we have hosted programs with over 50 lamas of all the lineages of Tibetan Buddhism. Your donations support the temple and its projects. Your offerings are much appreciated. Attend an event at Nechung Dorje Drayang Ling. Retreats with visiting lamas of all four lineages of Tibetan Buddhism are conducted at the temple several times a year. These programs are on various aspects of Buddhist philosophy & meditation. Michael and Marya Schwabe came to Wood Valley Temple in 1974 for a weekend retreat with a visiting lama. They had an interest in yoga and eastern philosophy, but had no specific Buddhist training. Upon hearing that Nechung Rinpoche would arrive the following year, they moved to the temple and prepared for his arrival with the intention to study with him. They lived with Rinpoche from 1975 until his passing in 1983, studying Buddhism and learning spoken and written Tibetan. While there have been countless volunteers since the temple’s inception in 1973, some for a day, others for a few years, Michael and Marya have remained a constant at the temple for 45 years. Inspired by and devoted to the teachings from His Holiness the Dalai Lama, Nechung Rinpoche, and other great masters, they have integrated the essence of Buddhist principles into their life and work. They have organized visits, teachings, and retreats for over 50 lamas of all the main Tibetan lineages, including H.H. the Dalai Lama on two separate occasions. Marya has served as the translator for many of these lamas and leads prayer services regularly with care and intention. Michael manages all aspects of the maintenance and expansion of the temple buildings and grounds. They direct the temple affairs, liaise with Nechung Monastery in India and other Buddhist centers. Under their guidance, the temple, its activities, and the surrounding land continues to flourish as envisioned by Nechung Rinpoche. 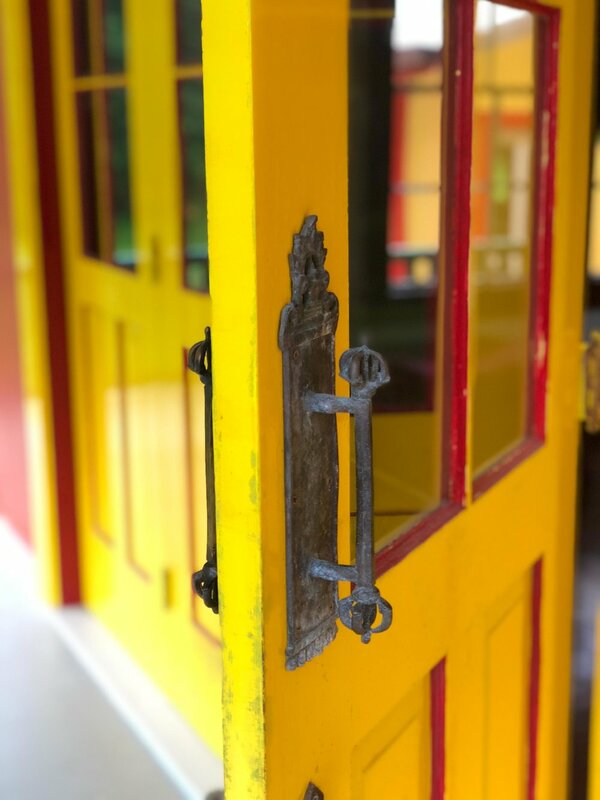 Since the coming of age of Nechung Choktrul Rinpoche, the reincarnation of the founding Nechung Rinpoche, Michael and Marya have worked closely with him to manage his yearly visits and teachings at the temple with the expectation that this will be his second home. 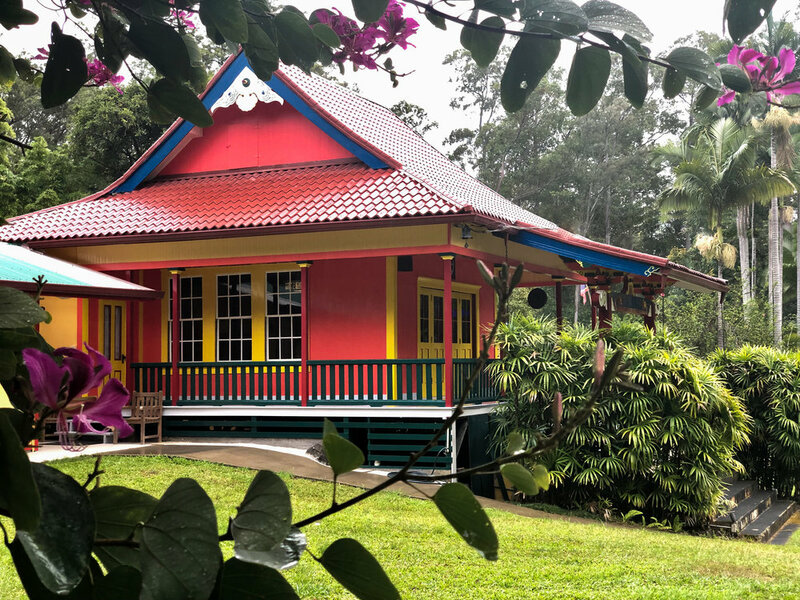 Currently they are leading plans to enhance the temple grounds with retreat and guest cottages as well as initiating an Endowment Fund to support the temple and continue its activities into the future. Michael and Marya feel very fortunate to have met and studied with some truly preeminent lamas over the past four decades. They are deeply grateful for the support of numerous people and hope that the existence of the temple sanctuary continues to be a catalyst for the inspiration of kindness and peace in the world.